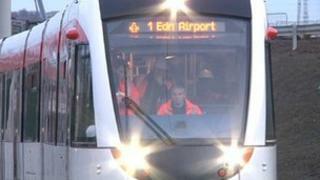 The next phase of Edinburgh's city centre tram works is due to begin this weekend. Existing works at Shandwick Place and Haymarket are being extended to include West Maitland Street from 05:00 on Saturday. New traffic diversions will be introduced in the area. Residents and businesses have been updated on the plans at a series of briefings to help them make provision for the changes. The city council has also set up the West End Focus Group, which has been tasked with identifying local issues and priorities and helping to increase footfall in the area as tram construction work continues. This will be supported through the Open for Business budget, which will see £175,000 invested directly into driving footfall towards the west end in the coming months. Dave Anderson, the council's director of city development, said: "Work on the tram project is now taking place along the length of the tram route. We would like to encourage people to visit the area as all businesses are open and operating as normal. "The latest move to expand the site into West Maitland Street will give contractors access to the most flexible possible space, allowing tram work to be completed in the fastest possible time. "We have committed £175,000 towards initiatives to attract people to the west end and will be rolling these out in the coming months." He added: "In the meantime we would like to encourage people to visit the area as all businesses are open and operating as normal. "We appreciate the continued support of the public and are confident the latest set of diversions will bed in quickly as work gets under way on this latest phase of tram works." The council said a revised set of diversions will be put in place, with access continuing for Atholl and Coates Crescents on either side of Shandwick Place, with one end of the crescent being open at any one time. Traffic on Torphichen Place will be reversed to flow from Morrison Street to Palmerston Place. Traffic from Dalry will also be able to travel along Morrison Street which will become two-way as far as Torpichen Place. Buses will be diverted locally via Rosebery, Grosvenor and Lansdowne Crescents in the north and by the West Approach Road in the south. Emergency services access will be maintained throughout the works. Current road closures are expected to be lifted at Haymarket by the third quarter of 2013 and at Shandwick Place by the second quarter of the same year.